What a busy Term 1 it has been so far! We have a few blog posts planned updating you all as to our recent activities. First of all we have a post about some recent improvement work that has been going on in the Department. After three months of hard work we have finally completed renovating our laboratory teaching spaces. Work started to clear the old labs in August, ripping out the old desks and furniture, and was finished only recently when the new white boards were delivered and installed. Two rooms were stripped and renovated. 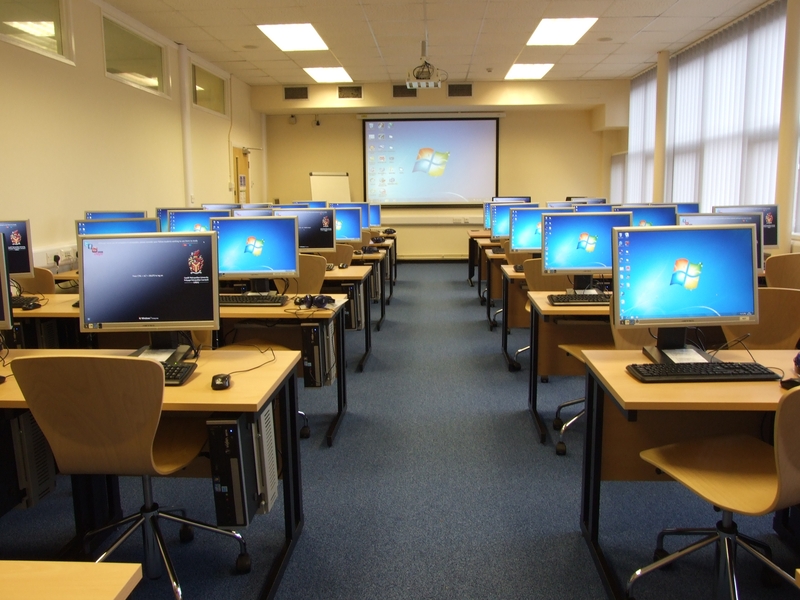 The Experimental and Speech Science laboratory housed a technician’s office and 35 computers now has 40 new computers, furniture, windows and carpet. Students are allowed to use the room for private study when it is not used for teaching. 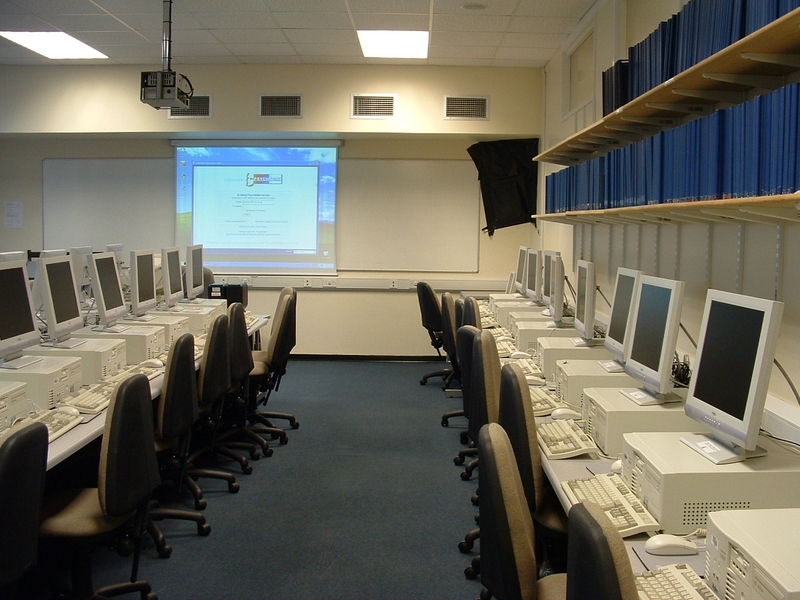 The Cognition and Speech laboratory had old equipment removed and new computers installed, as well as desks making it ready for seminars and tutorial work. To update the teaching lab we had to remove all the old desks and an office space. There were lots of cables that needed to be unplugged from the computers, and that took some time. Once everything had been stripped the room looked very different. 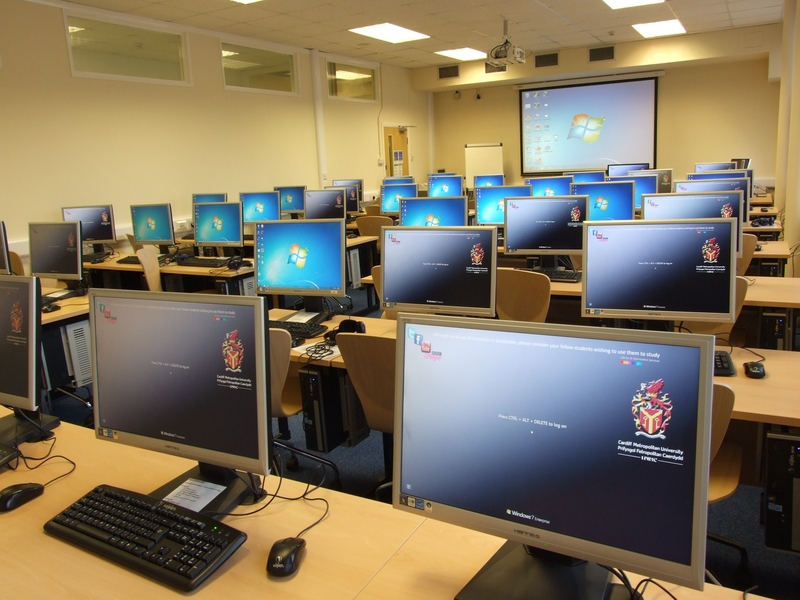 Lots of students had learned how to us SPSS (a statistics package) and the basics of experimental design here and so this was a crucial teaching space for the Department. It was quite sad to see the room empty, but it did mean that the renovation was in full-swing. New cabling and trunking for the network was needed, and the room clearly was having a special makeover. We did have a major set back half way through the work. The new desks had to be sent back as the supplier sent the wrong ones. We used examination desks for a while instead… which looked stylish in their own way! We finally now have everything in place. The new desks, equipment and layout make a big difference to how we can teach and interact with students in the lab. Having emptied the bigger lab we had to store everything somewhere. Fortunately, a smaller lab was nearby. 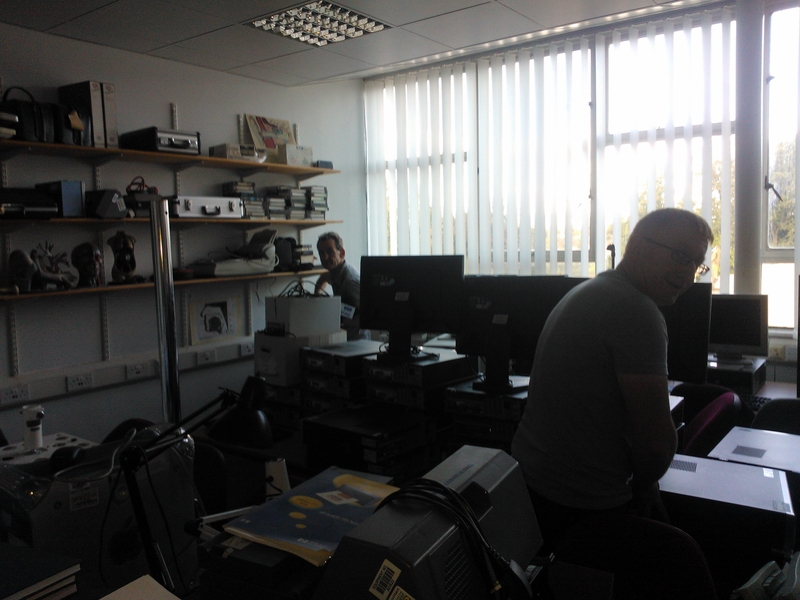 Geraint (nearest the camera) and Julian moved and stacked over 50 computers, which then needed to be moved so work could begin in the Cognition and Speech lab. The change to the room is fantastic. There are now drop down plugs for students to use laptops and other equipment. The space is ideal for seminars and tutorials. It is also used by students conducting experiments for their projects. 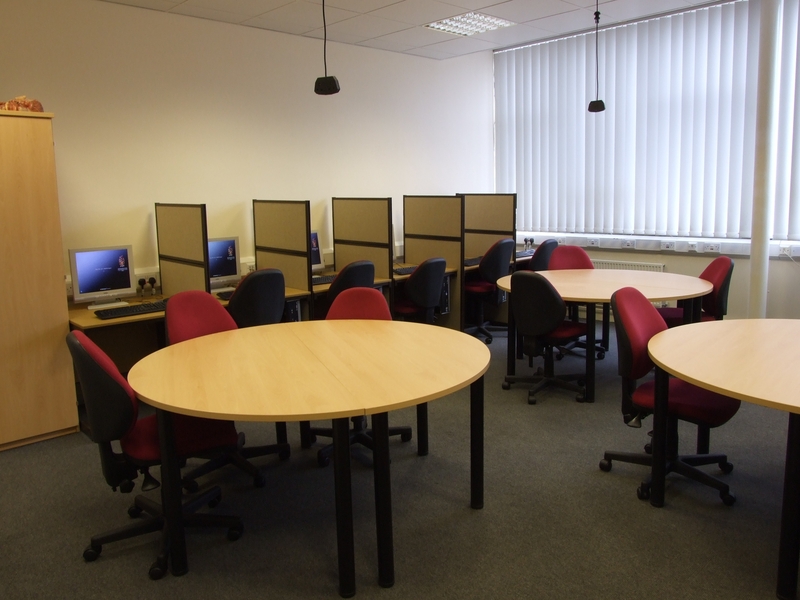 We have renovated a nearby room so that both labs have on-hand technical support, especially useful if students or staff need a hand setting up equipment. The lab looks much better now. Round tables help students work together and it is a relaxed and quiet room to work in. The renovation and investment into these two lab spaces shows how the psychology team think about how we can support students and how we continually invest for the best experience we can get for our undergraduates. We look forward to staff and students making the most of this room for years to come! D209 is now available for students to use as a quiet study room and we hope that this resource will remain a valued space.